The 2015 Sprint Cup season has felt like a marathon. With Kyle Busch’s win at the Quaker State 400, we only mark the half-way point of the 2015 Sprint Cup journey. Here’s a look at winners and losers as we cross the half-way line in this NACAR recap. It’s easy to say Joe Gibbs Racing won the race. They did have four cars in the top 5. But if I were Roger Penkse, I would feel pretty good about how Saturday night shook down for his team. The 2015 Sprint Cup season began with fair questions about how Joey Logano’s team would respond after those pit problems at Homestead. 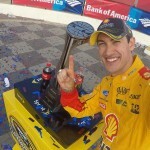 Logano proceeded to win the Daytona 500. And while Logano hasn’t won since, he’s tied with Jimmie Johnson for the second most points this 2015 Sprint Cup season. There are ups and downs in every Sprint Cup season; consistency is what wins. Looking at the 2015 Sprint Cup numbers, there’s no reason to think Logano and Brad Keselowski won’t be factors in the Chase with those four Gibbs and Hendrick cars, plus Kevin Harvick and Kurt Busch. These are drivers 30-35th in the 2015 Sprint Cup standings. Every week from now through Richmond, you will see their names as Kyle Busch tries to lap them in his Chase quest. It’s not flattering to get passed by someone who missed 11 races. There has always been a lack of competitive balance in racing; it seems larger now, in part because Kyle Busch is putting together a potentially historic run. The good news is NASCAR has a compelling comeback story. Moreover, the aero package worked, nearly doubling the amount of passes at a track where passing has been a challenge. The bad news is NASCAR doesn’t have a month to try and implement further changes. NASCAR seems onto something that could dramatically improve the racing and safety for 2016. In the meantime, we’re only half way through the 2015 Sprint Cup season. Busch broke his leg in an accident where there was no safer barrier. The narrative leading into Kentucky dealt with a mix of safety and speed after the Austin Dillon wreck at Daytona. 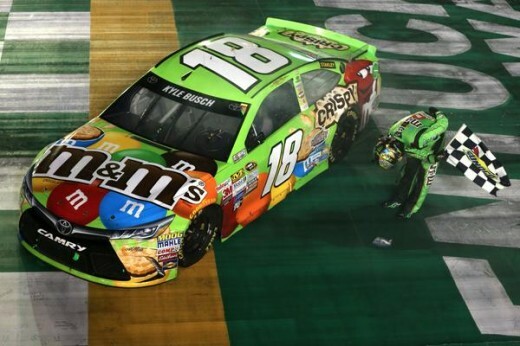 Busch won at Kentucky, where a horrible truck accident caused the race to end five laps early. 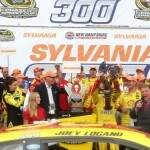 Safe and exciting racing is a delicate balance, one NASCAR must deal with for another 18 weeks. It should be a memorable second half to the 2015 Sprint Cup season. Enjoy New Hampshire week, and insert a random catchphrase here.